This is a contest or "lobbying game," in which each player chooses a lobbying "effort" that represents real resources used in an attempt to obtain a prize (e.g. a broadcasting license). The prize value is a specified dollar value, and the probability of obtaining the prize is equal to one's lobbying effort as a proportion of the total effort for the group as a whole, as originally specified by Tullock. Rent seeking activity entails real resource costs that dissipate the amount of value transferred to the recipient of the prize. 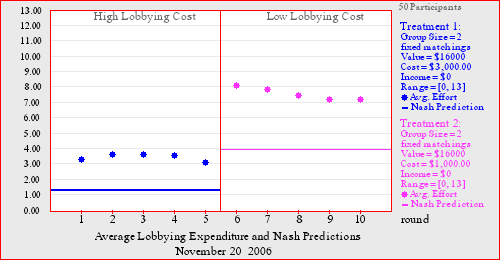 A reduction in lobbying costs will typically increase the amount of lobbying effort, which is the basis for the default class setup. The experiment can be used to motivate a discussion of the choice between non-market allocations and market allocations like auctions. In advanced classes, the efforts can be compared with Nash/Cournot predictions.